What is a Double Jogging Stroller? Being a parent is one of the best things in the world, but there are things you have to give up once you have kids – sleep, privacy, a clean house, and did we mention sleep? Your priorities change, but you don’t have to change everything about your lifestyle – if you were active before you had children, you can still be active afterward with the help of our best double jogging stroller reviews. But which brand is best? To help you find the best double jogging stroller for you and your family, we’ve conducted honest reviews on the top three products on the market. Each one meets our high standards for safety and quality, but one may suit your lifestyle better than another. The rest of this review will try to help you choose which is best for you. A double jogging stroller, as the name suggests, is a large buggy that fits two children and is specially designed for jogging. Unlike a regular double buggy, jogging strollers are usually equipped with brakes, either on the handle or on the foot, and wheels that lock in place to prevent them from swiveling while you run. Our reviews consistently find that they’re best suited to handle uneven terrain. Help You Stay in Shape: When you have kids, it can be hard to make time for exercise. A double jogging stroller allows you to have the best of both worlds by combining family time with workout time. Easier to Push: Even parents who don’t jog often mention in their reviews that they prefer jogging strollers over regular ones just because they’re much smoother and easier to push. More Safety Features: Because they’re built to handle greater speeds than a regular buggy, jogging strollers tend to be equipped with the best safety features. These include brakes, child-proof harnesses (that are actually child-proof), and sturdier frames. Always check reviews thoroughly to rule out possible safety hazards. Our review of the 2016 Summit X3 model from Baby Jogger found that it’s decked out with all of the latest safety features. The canopy fabric is UV resistant, and there are brakes on both the handle and foot of the buggy. One of the best things about the Summit X3 is that, for a double, it doesn’t take up much space once it’s folded – it can even fit in the trunk of a sedan. When you take it out to go for a run, the all-terrain wheels have no problem taking on dirt trails and bumpy wooden boardwalks. Something unique about the Summit X3 we found in our review is its ability to fold in just one step, which is a small convenience that can go a long way for a busy parent. The only major con of the Summit is that the handlebars are not height adjustable, but few people have reported that being a problem for their height or their partner’s height. The Thule Urban Glide had one of the best storage capabilities of any of the strollers we’ve seen – the underside basket is huge, and so are the pockets on the back. Our review found that it also had one of the best harnesses, able to keep curious kids from making an escape while still being comfortable. The Urban Glide double really glides, no matter what terrain you push it on. Strollers like this are the reason parents who don’t jog love jogging strollers best – you feel like you’re pushing air and not two toddlers. A twistable lever on the back of the buggy allows for quick one-handed folding, making storage a snap. One of the only things in our review that we didn’t like was that it did not come with an accessory tray for the handlebar, however, you do have the option to purchase one separately. The latest BOB double jogging stroller doesn’t disappoint – we found in our review of the product that it’s a smooth ride thanks to stroller’s advanced suspension system. It’s also a sturdy, durable buggy that will last longer than your kids will need it. The feature we like best about the FLEX is its car seat compatibility, which takes a bit of the hassle out of traveling with young children. Two-step fold is a cinch, allowing you to quickly stow it in your closet to wait for your next outing. We also mention in our review that we really liked how customizable this buggy is. Not only can the handlebar be adjusted to 9 different heights, but even the brakes can be adjusted for easy access. This feature works best when you need extra control while jogging down a hill. Of our few complaints with the FLEX, one that we discuss in our more in-depth review is that it’s a bit small for a double, and best for children three and under. Whether you jog every day or once in a blue moon, you can benefit from the smoothness and control that a double jogging stroller can provide. 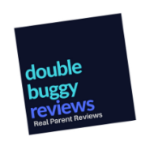 Now that you know the facts from our best double jogging strollers review, hopefully you’ll be able to decide which buggy is best for you and your little ones. Let us know if this review has been helpful, and check out some of our other stroller reviews for more information.